For beneficiaries who inherit IRA assets, there are a variety of options available for transferring funds from a deceased individual’s account. Unfortunately, having too many choices can complicate an already difficult situation. But what if you could help ensure a smooth and less stressful transition for your clients? By understanding the intricacies of the transfer process and the rules involved, you can do just that. With this in mind, here are nine questions (and answers) to help you and your clients better understand IRA transfers and beneficiary distribution accounts (IRA-BDAs). 1) What Are the Options for IRA Beneficiaries? Nonspouse beneficiaries. A nonspouse beneficiary must move the funds into an IRA-BDA in his or her name and take life expectancy payments accordingly. 2) When Should the First Required Minimum Distribution (RMD) Be Taken? Nonspouse IRA-BDAs. The first RMD must be taken by December 31 of the year following the decedent’s death. Spousal IRA-BDAs. If the surviving spouse is the sole beneficiary and the decedent died before reaching his or her required beginning date (RBD) (April 1 of the year following the year in which he or she turned 70½), the spousal beneficiary may defer RMDs until December 31 of the year in which the decedent would have turned 70½ or December 31 of the year following the decedent’s death, whichever comes later. The standard RMD rules apply. RMDs must begin by the spouse’s RBD (as explained above). Some scenarios may allow beneficiaries of IRA owners who died prior to reaching their RBD to not start RMDs by the required dates (detailed above) as long as the IRA-BDA is fully distributed by December 31 of the year containing the fifth anniversary of the decedent’s death. 3) What If the Inherited Funds Are from a Decedent Who Was Taking RMDs but Didn’t Satisfy the Annual Requirement Before Death? As the beneficiary, your client must satisfy all outstanding RMD amounts for the decedent, taken from the account opened by the beneficiary, by December 31 of the year the decedent passed away. 4) What If There Is No Designated IRA Beneficiary? 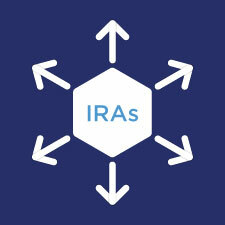 If there’s no designated primary or contingent beneficiary, the IRA type determines who receives the assets. Each IRA custodian has its own default beneficiary provisions. Traditional, Roth, SIMPLE, and SEP IRAs: The beneficiary is the account owner’s surviving spouse. If there is no surviving spouse, the beneficiary is the account owner’s estate. IRA-BDAs: The spouse of the IRA-BDA owner is not entitled to the assets unless designated as a beneficiary. If the IRA-BDA owner dies without naming a beneficiary, the decedent’s estate is automatically entitled to the assets. Spouse beneficiaries of IRA-BDAs cannot treat the funds as their own and move the funds into their own IRA. Beneficiaries must move the funds to their own IRA-BDAs and take life expectancy payments accordingly. Minor-owned IRAs: The beneficiary is the minor’s estate or is otherwise determined in accordance with the applicable state’s Uniform Gifts to Minors Act or Uniform Transfers to Minors Act. The custodian is not permitted to designate a beneficiary. 5) What If the Beneficiary Is a Trust? When the beneficiary is a trust, a trust IRA-BDA needs to be established from which life expectancy payments must be taken. If it is a qualifying “look-through” trust (the trustee is responsible for determining this), life expectancy payments are calculated using the age of the oldest trust beneficiary. If the decedent died before his or her RBD, the account must be depleted by December 31 of the year containing the fifth anniversary of the decedent’s date of death. If the decedent died after reaching his or her RBD, annual life expectancy payments will be required starting the year after death, based on the remaining life expectancy of the decedent determined in the year of death, reduced by one for each subsequent year. The authorized signer on the account is the designated trustee(s) of the trust. A signed Trustee Certification of Investment Powers is required at account opening. The trustee may be able to transfer inherited assets from the trust IRA-BDA to individual IRA-BDAs for the trust beneficiaries. A letter of instruction (LOI) from the trustee is typically required, authorizing the custodian to directly transfer the assets to an IRA-BDA for each trust beneficiary. A private letter ruling (PLR) from the IRS may be required. Best practice is to consult with an estate attorney before initiating the transfers. Assets may be transferred to different IRA-BDAs for the benefit of more than one individual, but the distribution rules for trust IRA-BDAs still apply. Trust beneficiaries cannot use their own life expectancies to determine their annual RMDs. Life expectancy payments must be based on the age of the oldest trust beneficiary. 6) When Does a Trust Qualify as a “Look-Through” Trust? The trust must be irrevocable, or by its terms become irrevocable, upon the original IRA owner’s death. The trust’s underlying beneficiaries must be identifiable as being eligible to be designated as beneficiaries themselves. A copy of trust documentation must be provided to the IRA custodian by October 31 of the year following the IRA owner’s death. 7) What If the Decedent’s Estate Is the Beneficiary? When the estate is the beneficiary, an estate IRA-BDA needs to be established from which distributions must be taken. If the decedent died before his or her RBD, the account must be fully depleted by December 31 of the year of the fifth anniversary of the decedent’s date of death. If the decedent died after his or her RBD, annual life expectancy payments will be required starting the year after death, based on the remaining life expectancy of the decedent determined in the year of death, reduced by one for each subsequent year. The authorized signer on the account is the designated executor, administrator, or personal representative of the decedent’s estate. Court documents naming this individual are required at account opening. If the inherited assets in the estate IRA-BDA are intended for individual beneficiaries of the estate, an LOI from the estate’s appointed executor, administrator, or personal representative authorizing the custodian to directly transfer the assets to an IRA-BDA for each beneficiary is typically required. Each estate beneficiary is required to abide by the distribution rules that apply to estate IRA-BDAs. A PLR from the IRS may be required. Consulting with an estate attorney is recommended. 8) What If a Beneficiary Does Not Want the Inherited Assets? Assuming all requirements are met, a beneficiary may disclaim any or all of his or her share of the inherited IRA assets within nine months of the IRA owner’s death. The disclaimant must not have accepted any interest in—or any benefits of—the property to be disclaimed. In such cases, the disclaimed portion would be allocated to the other primary beneficiaries designated by the decedent. If there were no other primary beneficiaries, assets would be allocated to any designated contingent beneficiaries. Beneficiaries should be encouraged to consult with a tax advisor regarding the implications of making a disclaimer and the requirements of a qualified disclaimer, pursuant to Internal Revenue Code §2518 and applicable state law. 9) What Are the RMD Rules for Someone Who Inherits an IRA-BDA? Because the assets were inherited from the original depositor, the beneficiary of the IRA-BDA is required to take the annual life expectancy payments previously established. The IRS does not allow the life expectancy calculation to be altered based on the life expectancy of the beneficiary. Mike has an IRA. He passes away and his sister, Sheryll, inherits the assets. Sheryll transfers the assets into an IRA-BDA and starts taking mandatory distributions based on her own life expectancy. Two years later, Sheryll passes away, and her son, Tom, inherits the assets originally inherited from Mike, transferring them to an IRA-BDA in his name. Because Sheryll had begun taking life expectancy distributions based on her own life expectancy, Tom must take life expectancy distributions based on the same calculation (i.e., on Sheryll’s life expectancy). He isn’t permitted to recalculate the payments based on his own life expectancy. Of course, each client's situation will be different, so you may recommend that your clients consult with a legal or tax professional before making this important financial decision. But no matter the circumstances, I think the IRA beneficiary information discussed here will help you and your clients make informed decisions regarding their IRA-BDAs. What other questions are your clients asking about IRA transfers and beneficiary distribution accounts? Please share your thoughts below!